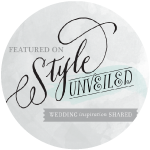 We are thrilled that we are featured on Style me Pretty twice within one week. Check out the post about Rob and Andrea's gold and blush wedding here. Check out the post about Stephanie and Paul's rustic and romantic wedding here.